In Steven Spielberg’s 2001 movie, AI Artificial Intelligence, scientists program a robotic boy to understand and express a full range of human emotions, including love. The boy is adopted into a family as a test case where he learns to connect with the couple who become his parents. After a series of unexpected events, the family’s living arrangement becomes unsustainable. The mother begins to fear the boy and abandons him in the woods, consigning him to an uncertain fate. The boys sets out to navigate a complex world where he’s neither fully human nor fully machine. Fast forward thousands of years to a time when alien life forms have arrived on planet Earth. Here, they discover the body of the robotic boy at the bottom of a frozen river and seek to reverse engineer his design. This quasi-human creation is their only connection to the Earthling inhabitants who preceded them, and they wish to understand his emotions. He was programmed by humans, they reason, so traces of their humanness still exist within his code. In addition to film’s impressive special effects, its evocative music, and the spectrum of feelings it inspires, this movie also teaches a lesson: software bears the marks of the people who write the code. All of the assumptions, biases, and predetermined social perspectives that we possess get baked in to the algorithms, creating smart machines that lack the objectivity we expect them to exhibit. They inherit our prejudices and act accordingly. Nowhere is this being discussed more widely, it seems, than in the application of AI to the law. The articles listed here, found in popular magazines and journals, describe various ways that AI is being used — and misused — to predict crime, sentence offenders, and determine the likelihood of criminal recidivism. They also explore the limits of AI, the ethics of using AI to mete out justice, and the regulations that some are proposing to counteract the harmful effects of machine bias. Hello, I’m Lawson, your legal robot assistant. How can I help you? This is the kind of prompt you might encounter on a website that offers customer service by chat. Friendly avatars greet you on retail websites, ready to sell you everything from appliances to vehicles. A virtual concierge, for example, might help you plan your next vacation. Even tech support is often provided via a chat or messaging feature. And now in law, chatbots or “robot lawyers” are facilitating access to the legal system and helping users handle simple legal matters. Perhaps the most well-known legal chatbot is DoNotPay, a tool that guides users through a series of questions designed to dispute parking tickets. In recent months, the DoNotPay chatbot has expanded considerably to address a variety of legal concerns including consumer rights, employment law, and landlord-tenant disputes. Soon, the creator of the site, Josh Browder, hopes to offer a chatbot that will handle your divorce. Hate Crime Help is a newer addition to the army of chatbots ready to help people who have been victims of hate crimes, including violence, verbal attacks, property damage, and harassment. The app lets you specify that the crime was motivated by discrimination based on race, ethnicity, religion, immigration status, gender, or sexual orientation. It then provides contact information for local resources linked to your zip code that will help you get the legal relief you need. Additional information about what the law says regarding hate crimes at the state and national levels is provided, along with a point-by-point comparison of hate crimes and bias incidents. ProTechMe uses a chatbot to quickly and efficiently collect information needed for securing a protective order in Harris County. Its design is based on the Texas Attorney General's Protective Order kit (which can be found here on TexasLawHelp.org). Information that is gathered via the chatbot auto-populates a pdf document that the user can then print out and submit to the district attorney or to a legal aid office. Victims of family violence are often closely monitored by their abusers, and using the Internet to search for help may not be a safe option. Although ProTechMe is still in development, it may, eventually, become a safer and more practical way for victims to get the help and information they need. Robots are unlikely to replace lawyers any time soon, if ever, despite media reports that sometimes sensationalize the impact of chatbots and related AI technologies. However, there is no doubt that technology will continue to shape the practice of law and change how clients interface with the legal system. Embracing technology as a tool for facilitating access to justice is advisable, for, as the robot overlords always say, resistance is futile. 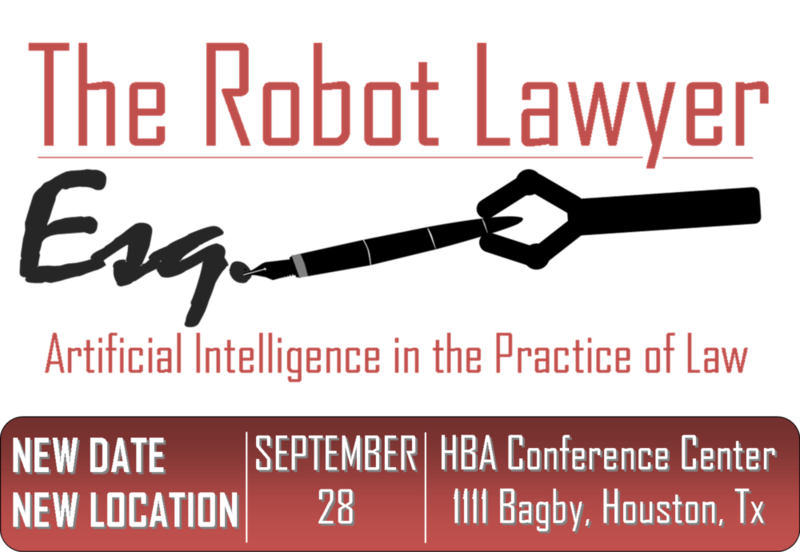 Join us on Thursday, September 28, 12pm - 1pm, for The Robot Lawyer: Artificial Intelligence in the Practice of Law. Saskia Mehlhorn, Director of Knowledge Management & Library Services, Norton Rose Fulbright US LLP will give specific examples of tools that incorporate AI technology and discuss opportunities for lawyers and other legal professionals. To register, click here. PLEASE NOTE: The location of this CLE has changed. It will not be held at the Harris County Law Library. The HBA is generously providing space for this event at the Heritage Plaza Conference Room, 1111 Bagby Street. Please see the announcement for further details.